"This is not the end of your marriage – just let me have it"
Although I was growing in my newfound faith, our marriage continued to be very up and down, to the point where Crispin and I were practically living parallel lives. We’d pretty much stopped talking to each other, which was very damaging for our finances and our children. So I made the momentous decision to pack my bags and leave the family home, staying with friends locally. I didn’t take the children, which was very hard on my husband. Everyone dealt with this in different ways. Catherine remained very stoic, while James would say, “I don’t know why you can’t talk to each other!” Alyce, who was 19 at the time, didn’t speak to me at all. For four months I spent time quietly alone with God. I wondered whether I had married the wrong person, but I knew God doesn’t make mistakes so I finally surrendered control and ‘gave’ my marriage to God. Crispin agreed to go for counselling together; although we’d stuck many sticking plasters on problems by going to various counsellors in the past, this time we knew we would either fix our marriage or it was finished. Our understanding counsellor helped us realise that we needed to accept each other’s personal backgrounds which had determined how we would both react in given situations. I also hadn’t realised before that I couldn’t love and had stopped people loving me. Crispin kept saying, “You’ve got to come back”, and the counsellor reminded us that neither of us had said we weren’t in love! But for a while I just didn’t feel ready – there was a power struggle going on inside. Eventually I decided to let Crispin take his God-given place as family leader and once I sensed we’d both reached the right place, I felt an assurance that all would be well and returned home. Even though I’d struggled with submission for years and my personality hadn’t changed, I slowly learned to put aside my pride and stop assuming my point of view was always right. Before, there would be so much hatred in my heart during an argument, but I finally realised, as the counsellor had said, that I loved my husband and he loved me. Even when things became heated, I started to accept Crispin’s decisions. Our home atmosphere is now completely different. When Crispin lost his telecommunications job at the end of 2017, we felt an amazing peace and strength to deal with the situation together, regardless of the financial strain. This would never have happened three years ago. 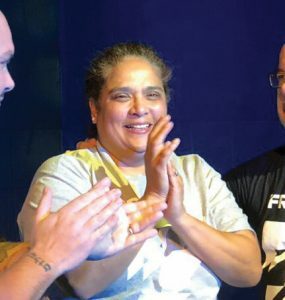 Last November, I was finally baptised by full immersion as a symbol of my new life in Jesus. I had kept putting it off, wanting our whole family to be baptised together, but the teaching at church convicted me of my disobedience. I now tell people that Crispin hasn’t changed, but that God has done a turnaround in my own heart. Come what may, I am still in love with him. I pray for Crispin every day and he has recently started volunteering for an adventure outreach called ‘Life Discovery’ run by the church. God has turned our marriage around so that no matter what hits us we can remain solid in him and faithful to the marriage we firmly believe in. I want to give all the glory to God, our provision and strength. Submit. I struggled with this for years (and still do!). But the book ‘A Woman after God’s Own Heart’ by Elizabeth George convicted me that God’s order in a marriage is for the wife to submit to her husband, as to the Lord. I realised that submission doesn’t make me any less intelligent or less of a person; I can still have my point of view and put it across, but Crispin gets the final say. Let him lead. I sensed the Lord show me that in struggling against my husband, I’m emasculating him and taking his rightful position. If both of you are trying to fight for supremacy, it’s like a two-headed monster – and neither of you will win! When I made the decision that it was not my responsibility to lead, I felt like a weight lifted off me. Build your husband up. If you knock your husband down with negative words, how can you expect him to treat you with respect? I am now Crispin’s greatest PR machine! We have also learned that our different ‘love languages’ affect how we show appreciation for each other. I prefer acts of service, while Crispin likes physical touch and spending quality time together.